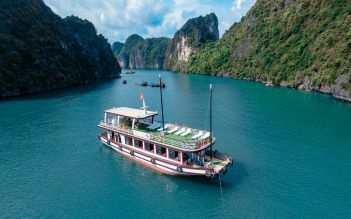 Ready for this unique experience then board Oasis Bay Classic Cruise, for 3 days & 2 nights exploring the breathtaking and peaceful view of Halong bay. Start cruising and enjoy our special feast of Vietnamese dishes while the cruise slowly slide on the romantic waves of Halong Bay. Relax on the sundeck or take part in our activities as kayaking in Ho Dong Tien, swimming, visiting Sung Sot cave and pearl farm, cooking class. 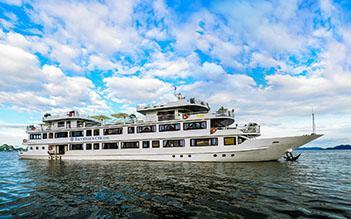 With Oasis Bay Classic Cruises excellent service in hospitality you will feel home. The tour guides are friendly and knowledgeable and this tour is friendly and safe for families with children and we guarantee you 100% satisfaction. Relax with many interesting activities such as kayaking, swimming, squid fishing, Tai Chi, etc. 7h00-7h30 Breakfast. Coffee & tea with assorted homemade pastries, fresh juices…. 15h00-16h00 Cruise to a Pearl Farm to see and learn firsthand how they harvest these shiny stones. 16h30-17h00 Get back on the Oasis Bay Cruise, take a hot shower and enjoy second night onboard. We stayed in the Suite with balcony for a day on the cruise and i must say that this was the best part of our trip to Vietnam. 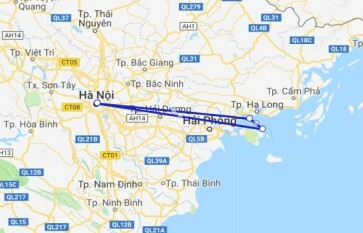 We were picked from our hotel by the cruise representative on time and the journey to Halong Bay took 4 hours from Hanoi. We boarded the cruise at 1 pm and were briefed on the itinerary and were served with refreshing juice during our check-in. We then had lunch and our dietary requirements (veg.) were taken care off. 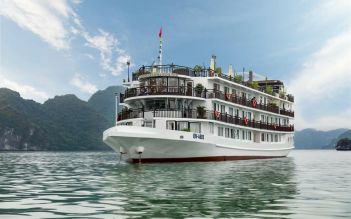 The cruise drives into secluded parts of Halong Bay which provides a refreshing perspective to the stay amidst calm waters and nature. The rooms were beautifully done and facilities on board included jacuzzi, bar and ample sitting deck to rest. The staff was amazingly helpful and went out of their way to help make this stay top notch and comfortable. We had kayaking as an activity and the next day morning had Tai-Chi class (which is ok..) and visit to the caves (fantastic and must visit). The refreshments and meals served were tasty. The only sore point was our trip back to Hanoi when the bus that was supposed to pick us up got delayed by 1.5 hours. We went on the Oasis bay classic cruise and enjoyed every minute. We were picked up at our hotel at the time specified and travelled to Ha long bay on a very luxurious bus, our guide Vin was very knowledgable and funny. Once we got to the marina we we only had a short wait to board our cruise boat. Sammy took over as our guide for the cruise, Sammy was excellent! knowledgable and had a good sense of humour, him as well as all of the staff on board made the trip that extra bit better. Would definitely book the same cruise again if we came back! We have an enjoyable and fun cruise thanks to our tour guide Victor, who was very friendly, helpful, patient, and also fun. Highly recommended if you are looking for an English guide, as his spoken English is excellent. Great attitude and very approachable!